On that night in Ennis in the home of my brother Martin and his wife Pauline (see ‘John Egan’s’), I thought I had captured Kevin Crawford playing a slip jig called 'What Care I For The Minister?' However, in the confusion, commotion, and mayhem that ensued when we realised that the tape recorder had been unplugged, it turned out that the slip jig Kevin played that evening was one called 'The First Slip'. Featured here on this track, this melody also appears in The Dance Music of Willie Clancy, a collection compiled by Pat Mitchell and published in 1976. Everything turned out just fine, as it happens: 'The First Slip' is a wonderful melody, and I was able to get my friend Kathleen Guilday to play 'What Care I For the Minister? ', found elsewhere in this collection. 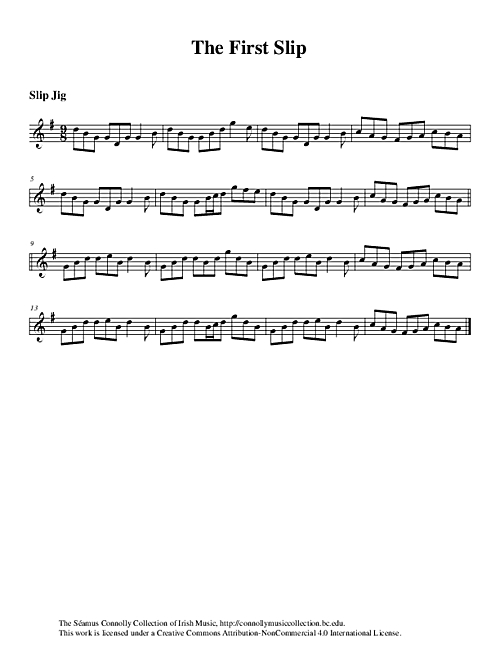 Crawford, Kevin (flute), “The First Slip,” The Séamus Connolly Collection of Irish Music, accessed April 20, 2019, https://connollymusiccollection.bc.edu/document/484.